If you’re Australian and looking to play roulette online, then there are quite a lot of options for you. When I write these articles, I tend to try and get the perfect casinos for that particular audience. So for Australians for example – I’ll be looking for casinos that offer Australian dollars. I’ll also be looking for online casinos that offer a lot of pokies. Those factors aren’t the be all and end all – roulette is still the primary indicator – but I’m still going to factor those on. I’ll also refrain from using any traditional Australian phrases such as G’Day Mate. All Slots Casino (Not available to Americans, but check out Roulette 5 at WinADay Casino instead. ):` All Slots Casino manage to hit all 3 of the checkboxes above. First of all, they offer Roulette. Tons of it. They have all 3 versions of basic roulette – American, European and French. They also have premium versions of those games, and offer multiple wheel roulette. If that wasn’t enough they offer Live Dealer Roulette AND live multiplayer roulette. Essentially, they have almost everything to suit your roulette needs. On top of that, they allow you to use the Australian dollar. And “All Slots” means they cover everything. They’ve got a crazy amount of slot machines and pokies to keep any Australian happy. Check out All Slots Casino (Not available to Americans, but check out Roulette 5 at WinADay Casino instead.) which we feel is the best online casino for Australians. Classy Coin Casino: (Closed down - Americans we recommend WinADay, everyone else we recommend Video Slots): The big thing about Classy Coin Casino for sure is the no deposit bonus. This is huge for you guys because it’s rare to find a roulette no deposit bonus, yet we’ve hooked up an exclusive $10 no deposit bonus for you. On top of that, Classy Coin offers a decent selection of games. They offer American Roulette, Eurpean Roulette and French Roulette. Classy Coin also offers multiplayer roulette which is great – if you’re like me, you don’t really consider roulette a solitary game so it’s nice to be able to play with other players online. Classy Coin uses the excellent RTG software. One thing I should note is they offer both a downloadable version of their casino and a browser based version. I would recommend the browser based version. It has the same selection of games but it seems to work a lot better. Omni Casino (Not available to Americans, but check out Roulette 5 at WinADay Casino instead. 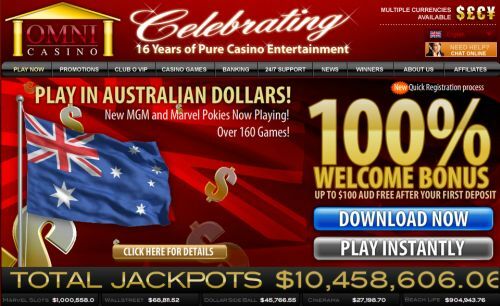 ): Using the Playtech software, Omni Casino is one of the best casinos for Australians. Most online casinos generally work on a global scale. So they have one casino that may be translated into different languages etc – but everything is pretty much the same. On top of that, they will run all these promotions exclusive for Australians. It’s pretty cool like that – they run specials just for the Aussies. They’re aware of what you guys like for example, and they’ll do promos that are all set up in your timezone. They’ll also run raffles, sweepstakes or contests all set up for Australia. In terms of Roulette games, Omni Casino offer a huge variety. You’ve got American Roulette, European Roulette and French Roulette. They then offer additional versions of them, such as premium versions of all those games to accomodate people wanting to play for bigger stakes. You can also play 3D Roulette – this is a really cool graphical version of the game, and it’s pretty amazing to play. As you can guess from the above – Omni Casino also accept Australian dollars. These guys have been around since 1997, so you know they’re trustworthy. All Australians get a 100% to $100 bonus in AUD and the wagering requirements are great – a lot lower as you don’t have your typical European bonus whore to mess thhings up. On top of that they offer Over 160 games, and some amazing pokies. Like MGM and Marvel pokies. All three of these casinos are great for Australians and use different software. It’s best to try out all three and you’ll find the ideal casino for you. So be sure to check out Omni Casino (Not available to Americans, but check out Roulette 5 at WinADay Casino instead.) for all the specific Australian games and promos. And be sure to check out the John Wayne pokie – that one is a ton of fun.